Thermodynamics and Chemistry is designed primarily as a textbook for a one-semester course in classical chemical thermodynamics at the graduate or undergraduate level. It can also serve as a supplementary text and thermodynamics reference source. A textbook on statistical thermodynamics at the senior undergraduate level. The course covers the statistical thermodynamics of ideal gases from quantized energy levels. Applications on gas reaction kinetics and kinetic theory of gases are included. Applications of the thermodynamic and statistical mechanics of small systems range from molecular biology to micro-mechanics, including models of nano-transport, Brownian motors, and (living or artificial) self-propelled organisms. Computational foundation of thermodynamics based on deterministic finite precision computation without resort to statistics. A new 2nd Law without the concept of entropy is proved to be a consequence of the 1st Law and finite precision computation. 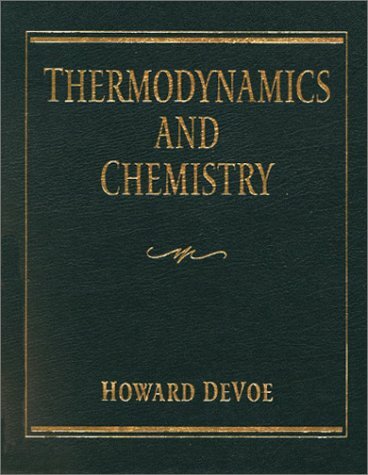 Contents: Introduction and overview; Thermodynamics; Foundations of statistical physics; Ideal systems: some examples; Systems of identical particles; General formulation of statistical mechanics; Interacting systems in thermodyn. equilibrium.